Sikkens Sadolin Jotun Butinox and Ronseal Wood Stain specialists. Based in the North West of England (but delivering across the U.K) Thornham Paint Supplies is one of the UKs oldest & largest independent suppliers of Paints, Woodstains, Wallpapers & Fabrics to public and trade customers. 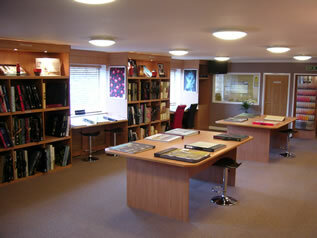 Our Oldham Showroom above contains probably the largest selection of designer wallpapers available! Here you can browse in comfortable surroundings virtually any wallpaper or fabric that’s available in the UK.